It’s getting much harder to reduce to writing the wisdom and truths that are emerging out of this group’s discussions. 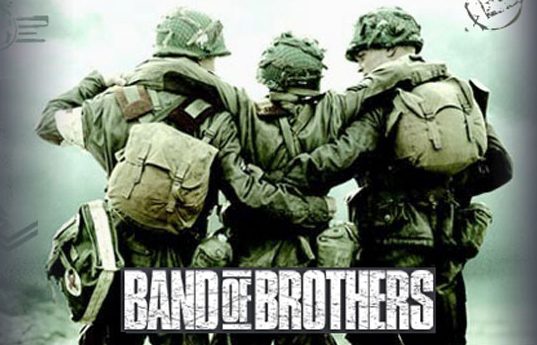 This week we watched the final video in the series Wild at Heart, titled “A Band of Brothers.” There are eight videos in the series and we have watched half of them. If you are interested in purchasing these videos for yourself, here is a link to the site. A special thanks to Bill McLaughlin and Mike Case for leading the live discussion tonight. In this video, John and his friends make a very persuasive argument that men need a small group of close friends, of like mind, who know each other very well and serve together in a mission that is bigger than themselves. They spent a good deal of time making the case for each of those requirements. Small Group – Live life with 4 or 5 very close friends. Don’t just meet once a week/month, but actually live life together. Not just the guys, either. The wives should be tight and the kids should play together, etc. This isn’t an accountability group, keeping you from doing wrong. Rather, it is a life group that draws out the best in us (and we out of them). Of Like Mind – The Wild at Heart series, and group of guys, is solidly Christian. Not everyone in our group is. We didn’t explore this aspect very deeply. Many people in our group probably just took the Christian part for granted. We should have spent a little more time on what this means for the non-believers in the room. Who Know Each Other Very Well – By now our group understands the value in not posing. (Read previous post on that subject here). Having guys who know you well will make hiding behind your false self nearly impossible. One of the military guys in our group described this in military terms, too. A true band of brothers have literally seen each others guts spill out in battle and have helped to stuff them back in, and vice versa. A graphic example, I know. But guys instantly understood the kind of understanding of each other this implied. Your golfing buddies you see Saturday mornings (only) don’t count. Serve a Mission Greater Than Themselves – We loved the idea of being on offense, instead of defense. Many people feel like they are in one battle or another at all times. Life is full of pressures that test us, and try to wear us down. It isn’t easy out there. It feels like we are always on defense. How great would it be to have a group of guys with whom we were actually taking new ground, rather than defending our own turf all alone. Many, many guys admitted that by Eldredge’s definition, they don’t really have a band of brothers. Literally, a lot of men fessed up to not having ANY friends by that definition, or maybe just one or two. One man said “I only have friends around my hobbies. I have guys I golf with, or ride motorcycles with, or fish with. I really don’t have any real friends who know everything about me, and who I live my whole life with.” Could John be on to something? Or, is this a ridiculous notion? Based on the comments as we went ‘round the room at the end, most men really long for that kind of friendship. Our society makes it very hard to find and develop this band of brothers. We find ourselves thrust into “friendships” based on circumstance – parents whose kids are in the same grade, or parents of kids who are in the same sports/activities with our kids. Other guys at work, etc. Sometimes we get a taste of what John’s group was describing. Guys who had been on mission trips, or served in the military together shared at least a temporary sense of really knowing the guys they were with. However, it was unrealistic to think that you could take that group of people and then get the wives and kids to like each other and just start living life together, even though you felt bonded with the guys. Is there another way? It was suggested that instead of trying to make a new band of brothers for ourselves, and abandoning our current relationships, we could try investing in our current group of friends. Who are we hanging out with already? Who are the guys in our life we see regularly, the wives are friends, our kids hang out? Could we take a risk and start having more real conversations with these guys? Could we invest in knowing them in a more meaningful way? Could we come up with a purpose to serve together that was greater than ourselves? Yes, we can. It will be interesting to hear the feedback from people after they have had a few weeks to try strengthening existing friendships, rather than just seeking new ones. It was mostly agreed that having a band of brothers would be nice. One of the most powerful moments of the night was when one guy suggested that without a band of brothers, we will always be on defense. It takes a group dedicated to each other and the mission to get on offense. Having a Band of Brothers would actually pull us out of the day-to-day struggles and get us taking a little ground for the greater good. So, if you want to be a better man, one of the objectives would be to make a difference in the world. Your best shot at doing that will include having a Band of Brothers as Eldredge defines it. Wow. Here are some quotes from guys about what they will be doing differently this week as a result of this conversation. I will be on the lookout for a band of brothers. I don’t have one now. I leave my guard down more than I should. I need to be focusing more on the battle. It’s about not being just surface friends. It’s about disciple-ing others. I feel like this is group is a Band of brothers whether you think of it or not. If I am going to have more meaningful friendships, I need to be more vulnerable. I put on a pretty good face most of the time. My friends have no idea what goes on with me most of the time. I’m trying to get my heart back. This group is really helping me do that. be alone. That’s my comfort zone. I want to be more available for friendship and coming to this meeting helps. I think my friends who are non-believers should be here, because they would see god here. It’s not going to be easy. It’s necessary and it’s brutal. I think I’ll start by trying to make people happy to be around me. Great night tonight Aug 6. Packed house again.